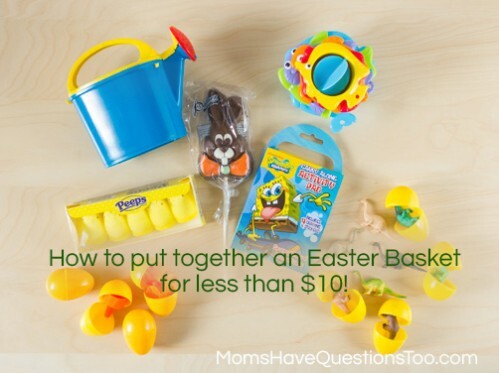 Easter Baskets for Under $10! Once my research was done, I was determined to put together nice, inexpensive Easter baskets that weren’t filled with too much candy. (Let’s just say that Halloween brought a little bit more candy than I was expecting and I am not eager to repeat that experience.) So, I put together these gift baskets that are not too overdone, have very little candy, and are very inexpensive. 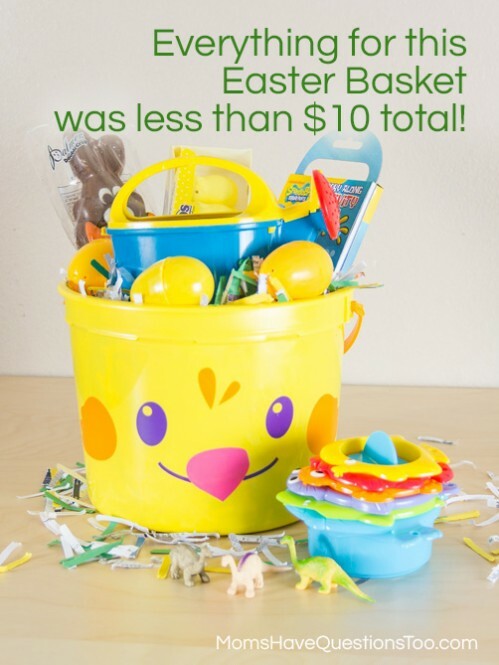 I will actually be adding a few religious things to the baskets (it is Easter after all), but I haven’t bought them yet so they are not included in this post. 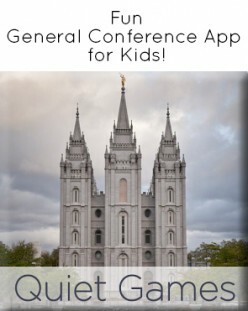 I set a budget of $10 for each child. We will be having a separate Easter egg hunt on the Saturday before Easter which will include dyed Easter eggs as well as Easter eggs filled with a bit of candy. 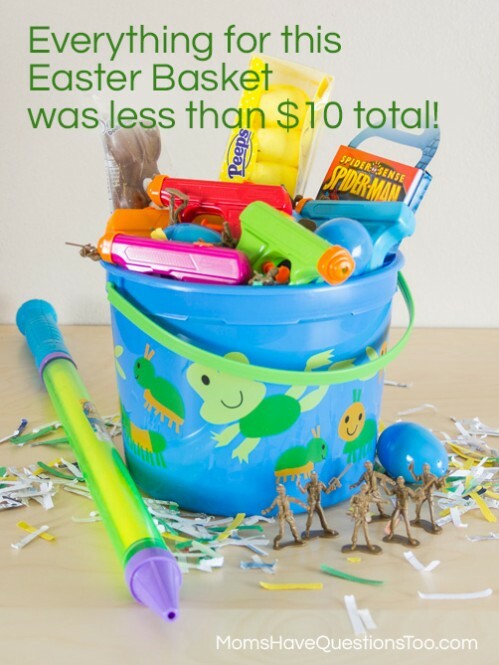 I did not include the cost of those in these Easter baskets. Also, I bought a pack of 48 Easter eggs for $2, but since I only used ¼ of the bag for each Easter basket, I counted $ .50 for the Easter eggs. Also, I bought of package of peeps that had two cardboard rows in it, but I split it between Little Bear and Smiley Man. I wanted the Easter basket eggs to be filled with something other than candy, so I filled them with water balloons and small toys. Check out my Easter Gift Ideas post for lots of non-candy items to fill Easter eggs with. Last of all, I used shredded paper as Easter grass. I had the shredded paper leftover from a St. Patrick’s Day Sensory Bin we did a few weeks ago. The shredded paper as Easter grass was definitely my favorite idea for these baskets. 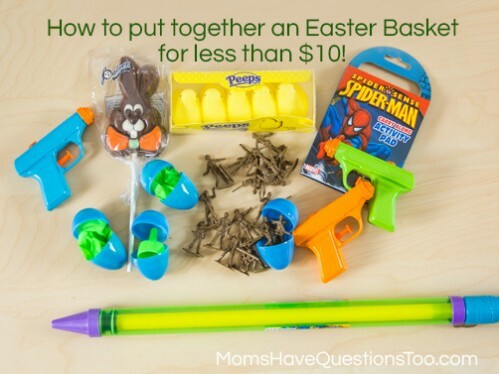 ;) And now, here are the two Easter baskets for under $10! ← Inexpensive Easter Gift Basket Ideas for the Whole Family!